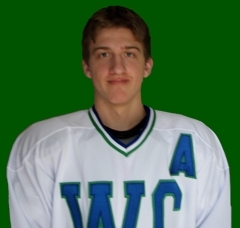 The Seattle Totems ended their very successful evaluation camp June 1st tendering 5 Northwest players. Coach Mike Murphy was elated with the level of talent at the camp, especially the 91 and 92 groups stating "The players that we had here had great physical size and many showed a tremendous skill set" . The Totems commitment to Puget Sound players was most evident in the 52 players that attended the camp. Coach Kris Wilson commented "No doubt we saw most of the top young talent in the NW. This core group that we tendered along with others that we have invited to main camp bodes well for the present as well as the future. These players go a long ways towards continuing the Totems winning tradition, all 5 of these players are proven winners and leaders". Branden Vandermoon, a 6'0" 185 lb 1992 born wing from Everett, Wa. played last season for the SJHA U-16 AAA team that won the state championship. Branden has been invited to the USA Hockey NTDP U-17 camp in Lake Placid, he has a nose for the net and shows plenty of grit down low. Kyle Peterson, a 6'2" 190 lb 1992 born center from Tacoma, Wa. also played for the U-16 AAA team out of SJHA. Kyle is probably the most highly coveted 92 in the northwest. His style is pure power forward, with his size and vision of the ice he will be a force in NorPac. Shawn Pauly, a 5'10" 175 lb 1992 born forward from Bellingham, Wa. played a major role for the West Coast U-16 AAA team last season. Shawn is extremely quick with good vision and great hands and plays with an edge that will give opponents fits. John Dennis, a 6'2" 187 lb 1992 born defenceman from Bellingham, Wa. played for the Whatcom U-18 AA team that won the PNAHA state championship last season. John is a big, physical dman with a bit of a mean streak who is very effective in front of the net yet he finished this last year with 16 goals and 24 assists to go along with 104 pims. Anthony Patt, a 5'10" 180 lb 1991 born forward from Arlington, Wa. will be coming to the Totems after playing for the Gilmour Academy U-18 AAA team in Ohio. Patt is a physical, gritty 2 way player who has shown to be a penalty kill specialist with his speed, vision and tenacity. Coach Murphy stated "I am ecstatic that Anthony is returning to Seattle to play for the Green and White, this kid can really play". Patt played his youth hockey within the SJHA program. The Totems staff feels privileged to welcome these five outstanding players to the Seattle Totems family for the 2008/09 season.